The biggest corporate failure ever in British history occurred in 2008 with very little forewarning. The management of HBOS, a major national bank with a long history of prudence prior to the merger in 2001, were allowed to act incompetently. Auditors and regulators failed to act, ignoring a key senior whistleblower, and the ‘competitive’ stock market failed to spot management failure in time. This book is the first academic study of this collapse, uncovering some surprising evidence on the power and politics of large financial institutions. It details the processes and degrees to which financial challenge and regulation are undermined by this power. The research exposes a pro-active process of regulatory risk management by these institutions; the ease with which auditors and regulators can be captured; and how politicians and investors can be all too happy to hop on the stock market and management spin ride – with other people’s money. 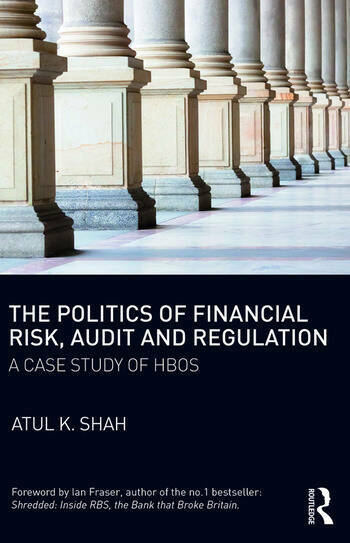 The study questions the ideology and politics which supported and encouraged the management hubris, raising profound questions about the ‘politics’ of the academic disciplines of banking, finance and accounting today, and the theories they underpin. This account of management gone wrong is essential reading for students, researchers and professionals involved in banking, finance, credit infrastructure, economics and management studies. Atul K. Shah is a Chartered Accountant and member of the Institute of Chartered Accountants in England and Wales. He has a PhD in Accounting and Finance from the London School of Economics. He is also a Professor in Accounting and Finance at Suffolk Business School, Ipswich, UK.